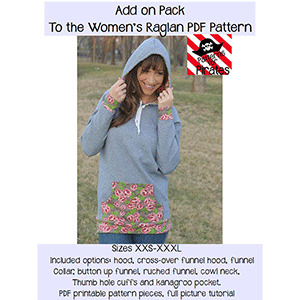 This Add on Pack Pattern is a supplement pattern to the Patterns for Pirates Women's Raglan Top and you must own this pattern for the main body of the shirt! 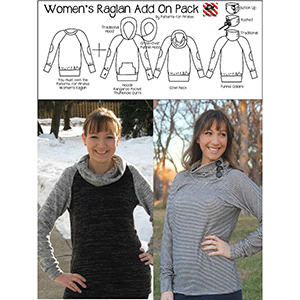 The Add on Pack allows you to choose from even more options: hood, cross-over funnel hood, funnel collar, button up funnel collar, ruched funnel collar, cowl neck, kangaroo pocket and thumb hole cuffs- all which pair perfectly with the women's raglan! 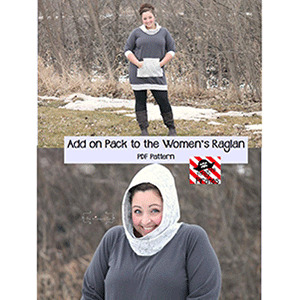 You can now make hundreds of these shirts all looking completely different! !